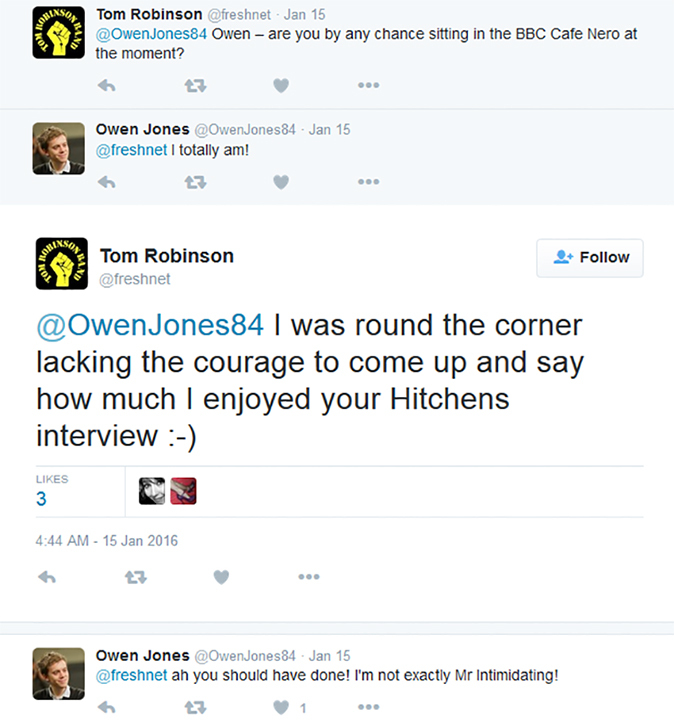 “Is that Owen Jones?” whispers Tom Robinson with some excitement. We peek round the corner and can’t quite make up our minds. We’re at the BBC Café Nero to interview the 2-4-6-8 Motorway singer and 6Music DJ about… well, to be fair, we had quite a big list. David Bowie wasn’t on it, but as he’d passed away at the start of the week, he came up quite a lot. The trouble is Robinson has done too much bloody stuff. Where do you start? BBC Introducing and new music, LGBT rights, mental health, the Tom Robinson Band, his latest album and tour, Rock Against Racism, Pledge Music, Activism, the upcoming 6Music Festival? We went with his tour, albeit very briefly. In a week when all we’ve heard is glowing tributes, puff pieces and well raconteured tales of 70s debauchery, it’s refreshing to hear this sort of reflection… particularly as a lead in. Our “Mr Clapton?” is met with emphatic nods. “I think he’s still a secret Powell-ite,” adds Robinson. In fact, it was the Cream singer’s onstage endorsement of Enoch Powell and his ‘Rivers of Blood’ speech back in 1976 that spawned the Rock Against Racism Movement that Tom Robinson (who’s today sporting a ‘Nazis are no Fun’ RAR badge) helped drive forward. The newly formed Anti-Nazi League (today known as Unite Against Fascism) helped drive RAR into the national consciousness by involving mainstream artists such as The Clash, Stiff Little Fingers, Elvis Costello and The Specials. It’s clear that grassroots movements are a big thing for Robinson, none more so than the work he does championing new bands and artists with his BBC Introducing show. “The great thing about BBC Introducing is that it actually allows the bands to contact us direct, without having to go through a plugger and submit the music to get heard. I can’t really overemphasise how important that is, because traditionally, all the time I’ve worked in music it’s always had to be mediated by a third party. Following the huge success of the Tom Robinson Band in the 70s, a steady solo career in the 80s – that yielded songs such as War Baby and Atmospherics: Listen to the Radio – the 90s saw him attracting attention for, quite frankly, ridiculous reasons. Having long been a proud gay man, a vocal activist for equality and the singer of the anthem Glad to be Gay, the tabloid press were delighted to discover that Robinson had fallen in love with a woman and started a ‘conventional’ family. Identifying as a gay man who happened to be in love with a woman was not an easy point to get across at first. After receiving 15 years of adulation at Pride, Robinson was booed offstage and given the cold shoulder by many members of the community, before being invited back to Pride in the late 90s. The media, of course, have continued their obsession with sexual and gender labels. Only now it seems to have gone full circle. “Just be whoever you want to be…” reiterates Robinson. It seems fitting that a chap so committed to diversity has ended up as a DJ on BBC 6Music: a station where a commitment to grassroots and live music is what sets them apart. Next up on their agenda is their 6Music Festival in Bristol starting on the 12th of February. Robinson will be there, running workshops with musicians, introducing bands and putting out a live show (along with many of the other DJs) from the festival. That’s not to say Robinson has been ignoring his own new music of late, as 2015 saw him put out Only the Now, a folk-punk collection of social commentary and catchy tunes. Produced by Gerry Driver, Robinson’s first new album in nearly 20 years features collaborations with – amongst others – Billy Bragg, Nadine Shah, Lisa Knapp, Martin Carthy, Swami Baracus and John Grant… as well as the actors, Colin Firth and Sir Ian McKellen. By crowdfunding the record on Pledge Music, fans were given an opportunity to get involved with making it. “One of the most popular pledges we offered was the chance to come down to the studio and hear the rough mixes… and meet the people making the album, have a glass of wine with us, and maybe sing on a track. It’s been a weird week and Robinson has just been working out the details for a Bowie tribute show he’s putting together for 6Music. “We’ve got Brian Eno talking about the making of the [Berlin] Trilogy… Eno was saying that during the making of Heroes – you know this terribly serious art-rock project – Bowie insisted on talking in Derrick and Clive voices for the whole time. Have a final nose around the corner, then pop back onto Twitter to check if we really had been playing peek-a-boo with the Guardian’s Owen Jones earlier.